Landscape integrated pest management (IPM) uses research and common sense to allow mindful, informed decisions for landscape health. It is a holistic approach, taking into account many different variables and biological relationships. Practicing IPM requires knowledge of plant science, plant pathology, and entomology. Using regular monitoring and a preventive approach, treatment options are weighed against one another to find the least toxic and most practical control options for the property. 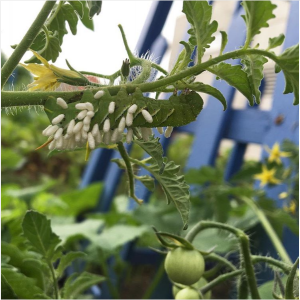 This approach reduces the use of pesticides, and conserves beneficial insects, symbiotic fungi, and other favorable organisms present in the landscape. It benefits the health of your landscape, providing a more sustainable long term affect and an overall economic benefit. Integrated pest management starts by being mindful of your landscape conditions. Plants can’t get up and move if they are stressed in their new home. The plants we choose for our landscapes, which are adapted to thrive in specific environmental conditions, require the correct site conditions. Less stress allows the plant to allocate more resources to defense mechanisms, reducing susceptibility. Observe the light/shade, moisture, USDA hardiness zone, temperature fluctuations, height and space available, and plant accordingly. One of the most common gardening mistakes is planting alkaline soil loving plants (like boxwoods and lilacs) with acid soil loving plants (like azaleas and Rhododendrons). 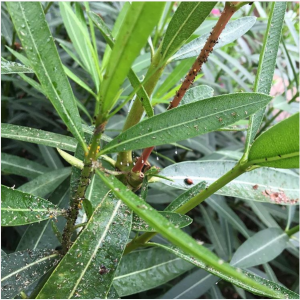 Another very common mistake would be planting azaleas, Rhododendrons, and Pieris japonica in sunny, dry sites, like a South/West facing wall, an environment favorable for lace bug and stressful for the plants. At Mead Tree & Turf Care, we base your IPM program on your landscape’s environmental and soil conditions, plant inventory, and pest and disease history. Damage can be caused by abiotic factors such as weather, site conditions, mechanical injury, or chemical injury (like herbicides or car exhaust). If the damage affects many different species in an area and is relatively uniform, it may have an abiotic cause. The homeowner’s aesthetic thresholds may not be possible to meet when certain abiotic factors cause unavoidable damage. For example, we are expecting symptoms of root rot injury to show as the weather gets hot this year caused by last year’s record breaking rainfall. Mead Tree & Turf Care combine the plant inventory with the University of Maryland’s pest predictive calendar, and a growing degree day calculator to keep up with emerging key pests of your specific host plants. We use current research to develop a preventative fungicide programs for most common plant diseases, and keep our eyes open for any newly emerging problems. Some host plants are extremely susceptible to diseases. Diseases that are pervasive in mid-Atlantic landscapes include cherry shot hole, rose black spot, spruce needle blight, and apple scab. Mead Tree & Turf Care stays current with the latest research and tools. Using the University of Maryland’s weekly pest reports allows us to keep up with what the industry is seeing locally. Differing yearly weather patterns create the optimal environment for different diseases, and sometimes pests, and no year is exactly the same. By referencing IPM research and guide books provided by UMD, Penn State, Cornell, and other leading universities, we are able to develop pro-active pest and disease management plans. By attending yearly trainings and conferences, our staff is up-to-date on new research and treatment options. 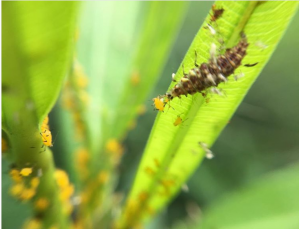 Scout the property for emerging pests and diseases, according to the current growing degree day, weather conditions, and the MTTC scouting list. Identify unforeseen problematic pests and diseases. Unknown organisms are sent to UMD plant diagnostic lab or UMD IPM extension specialist for identification. Monitor and record emergence dates of pests and diseases in the property history. This helps us in preventative planning for the next year. Maintain Maryland Dept. of Agriculture Pesticide application records. Implementing IPM for your landscape is a learning process. Much has changed in the pest management world over the past couple of decades. We with better research and tools available, landscape IPM techniques will keep changing as research continues to reveal more about the roles humans play in the natural environment. Yet one constant is that the IPM plan reflects the homeowner’s individual aesthetic threshold. This can vary, depending on the homeowner’s connection to nature, the sentimental and aesthetic value of their plants, and their interest their environmental footprint. As you learn about the ecological interactions happening right in your own backyard, your thresholds may change as well. For example, caterpillar colonies can be aesthetically displeasing and can cause damage on small trees. However, they do not cause significant damage on mature trees and are an important source of food for birds. Entomologist Doug Tallamy states in his book Bringing Nature Home that 96 percent of North American terrestrial bird species depend on insects to feed their young. One brood of chickadees will need about 9,100 caterpillars to grow to maturity. Appreciating the natural phenomenon in your own backyard opens new possibilities of connecting with the world around you. We look forward to seeing you out there!